2015 has started with all the glory and awesomeness! After organizing two successful editions of Wiki Academy in Kosovo, IPKO Foundation has recently started to prepare the special version of Wiki Academy, which will be organized this time in Kukes, Albania. Wiki Academy Kukes is an open competition about the best article and best picture uploaded in Wikipedia. The participants will compete to create the most professional article which tells a story about Kukes, and snap the highest resolution photo which hides a story. Through Wiki Academy Kukes, IPKO Foundation aims to involve youngsters of Kukes in the process of writing and editing articles for Wikipedia, and get them to experience a weekend full of activities, learn new things about their country by choosing a topic to write about, gather information, edit, and share it with the world. Wiki Academy Kosovo started two years ago, with the main purpose of improving Kosovo’s image in Wikipedia, for the world. During the first edition of the Academy, 40 articles and 1418 pictures of different subjects and fields were published on Wikipedia. Last year, Wiki Academy II – City Marathon brought together 270 young wikipedians who posted 78 great articles. In the same time, 98 photographers posted more than 1450 pictures in Wikimedia Commons as part of the photo contest of the Academy. This project comes as a result of a great team and partners, as well as supporters. IPKO Foundation in cooperation with ALB AID, Parners Albania, American Corner, FLOSSK and Open Labs, supported by Norwegian Embassy in Kosovo are working hard together to bring something really cool in March 2015! 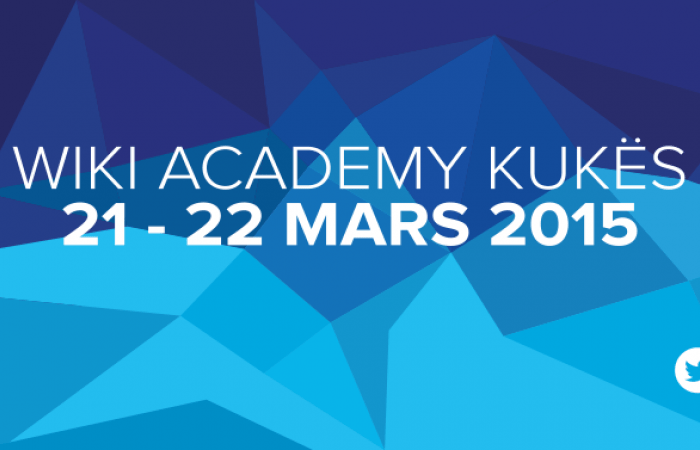 Wiki Academy Kukes is all about education, new experience, and fun! If you are a youngster of Kukes and strive for change, join us and apply here. Join the Wikipedian community on social media here.